Continuing our TEDMED 2013 series, we bring you a bit of “out of the box” thinking from Thursday’s sessions. We started the morning with an interesting debate between Marleece Barber, Jennifer Kurkoski, Rick Valencia, Geeta ayyar and Jeff Degraff. The focus of the debate was innovation and you can follow the hashtag here. One of the key aspects broached here was the fact that whatever gadget the health industry comes up with it has to be able to comfortably integrate with the patient-physician relationship. The use of additional devices tend to get in the way of actually treating the patient as a person because the healthcare professional is increasingly looking at a screen. An interesting thought to keep in mind for you developers out there. Ryan Panchadsaram’s talk on health literacy and doctor-patient collaboration was one particularly insightful discussion of the day. He pointed out that when it comes to medical records, it’s not often that we think of patients of co-creators of their medical records. He highlighted the use of design and proper visualization of patient information to help engage patients and allow them to exert their rights. More information on this kind of initiatives can be found here regarding the Blue Button Initiative. 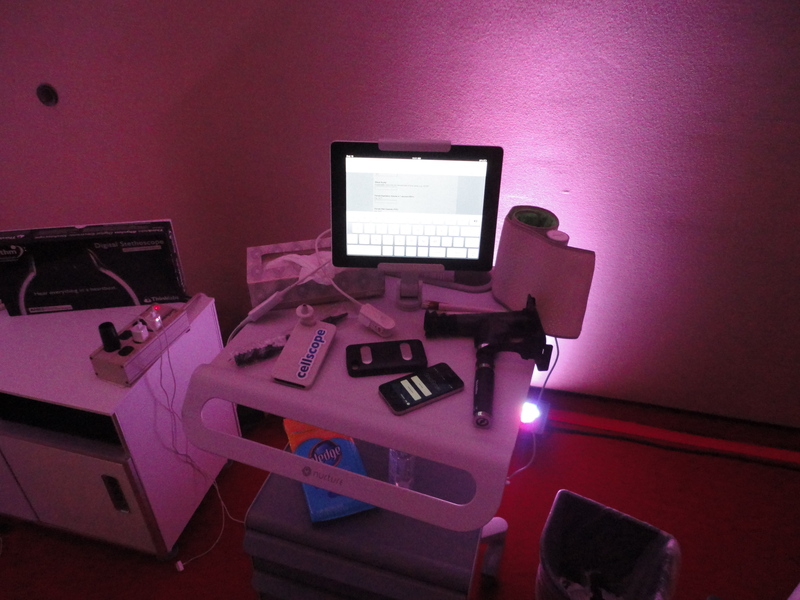 An interesting display available at the Hive was that of “The SmartPhone Physical”, a set of smartphone-based devices that provide clinically relevant information that’s being described as “the checkup of the future”. The devices collect data ranging from simple readings of weight and blood pressure to more complex readings such as heart rhythm analysis and visualization of the back of the eye. blood vessel visualization using a Mobisante ultrasound probe.